Le Poisson Rouge is a music venue and multimedia art cabaret in New York. They needed a digital presence to match their dynamic and revolving program. One of the things that makes LPR so special is its diversity in programming. However, this also presents a challenge in messaging. Those who know LPR from their classical music performances may not know about their indie rock shows or weekend dance parties. And vice-versa. How do you communicate all your offerings to your different audiences, without loosing your core base or diluting your message? For LPR, we wanted to create a site that was media-rich, versatile and dynamic information hub. This is not only a place you visit to find out who is playing at LPR; it’s a resource to find out more about what is happening in music. Our intention was to make the site a destination. In doing so, it doesn’t matter what the genre of music is; if it is at LPR, you know it has to be good. In creating this subtle shift, new audiences will be exposed to genres they may not have been open to in the past. The LPR stamp is all they need. In order to achieve this, we concentrated on showcasing and connecting the content on the site. 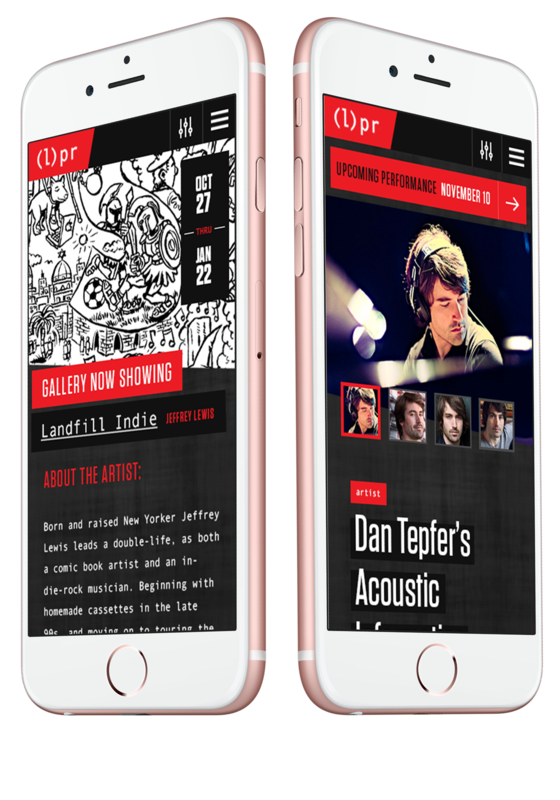 For example, the artists who perform at LPR all have a variety of content – audio, video, websites, social. We made sure that the site was able to present this content in a seamless and clear way. The result is site full of substantial content you can explore and engage with, while still being able to quickly find what you need when you need it.